At least 690 people were executed globally in 20 countries in 2018, compared to 993 in the previous year, the organization said in the report released April 10. The statistics assess the use of the death penalty worldwide except in China, where the number of people executed each year is a state secret. The figures “show that the death penalty is firmly in decline, and that effective steps are being taken across the world to end the use of this cruel and inhuman punishment,” it said. Amnesty International also recorded commutations or pardons of death sentences in 29 countries last year. While “global consensus is building towards ending the use” of the death penalty, “with more than 19,000 people still languishing on death row worldwide, the struggle is far from over,” the organization said. The death penalty is a cruel violation of the basic right to life and robs people of the chance to repent and make amends for the crimes they have committed, the pope said in a video message to participants at the World Congress Against the Death Penalty Feb. 27. 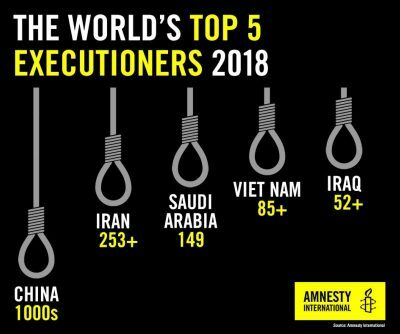 The Amnesty International report said while “thousands of people are sentenced to death and executed each year” in China, 78 percent of all reported executions in 2018 took place in just four countries — Iran, Saudi Arabia, Vietnam and Iraq. Following a change to Iran’s anti-narcotics laws, the country’s rate of executions dropped by half, from at least 507 in 2017 to at least 253 in 2018. In Pakistan, 14 executions were recorded in 2018, down from 60 in 2017. The number of executions in Somalia dropped to 13 from 24. At the end of 2018, 106 countries had abolished the death penalty in law for all crimes, and 142 countries had abolished the death penalty in law or practice, the organization said. Last year, Burkina Faso adopted a new penal code that effectively abolished capital punishment, while Gambia and Malaysia both declared an official moratorium on executions. Also last year, Washington became the 20th U.S. state to outlaw capital punishment when a court banned it. The state’s Catholic bishops applauded the October ruling that its use is arbitrary and racially biased. However, some countries saw a rise in executions last year, including the United States, Belarus, Japan, Singapore and South Sudan, the organization said. Also, Thailand carried out its first execution since 2009. Sri Lanka announced it would resume executions after more than 40 years, and an ad seeking hangmen was placed in a state-run daily newspaper. Last December, Pope Francis said countries that have not abolished capital punishment but have adopted a moratorium on executions also should ban the death penalty as a possible punishment for crime. A temporary moratorium “cannot be lived by the condemned person as a mere prolongation of the waiting period for his or her execution,” he said.